Blog Is there a cheap gastric sleeve surgery in Fort Myers or Naples? Is there a cheap gastric sleeve surgery in Fort Myers or Naples? 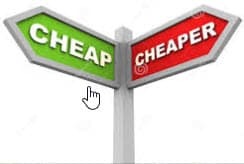 Cheap is a relative word when it comes to your health. How does one place a monetary value on one’s health? Bariatric surgery is a life-changing procedure that will overall be less costly, it is estimated that most patients save around $900 per month after just the first year, with estimates showing around $11,000 per year 2 years out. The current, projected out-of-pocket cost for an insurance covered gastric sleeve in 2018 is related to the financial obligation you have with your insurance carrier. This can be as little as no out-of-pocket cost to approximately $3500. Call your insurance provider to determine your deducible, co-insurance, etc. If you don’t have insurance or your insurance will not cover your gastric surgery the out-of-pocket cost can range from $15,000 to $19,228. Here at Surgical Healing Arts Center, we are competitively priced at $15,000 without insurance for a gastric sleeve while continuing to keep the most comprehensive and inclusive treatment plan for our patients. A cheap gastric sleeve surgery in Fort Myers and Naples, Florida is relative to what is covered by your insurance and what you have to pay out-of-pocket for the procedure.